We have been day dreaming recently about our summer holidays. Thinking about what food we would like to eat and where. Dreaming of hot sun on our face, chilled white wine and something delicious. This is our favourite way to procrastinate. And this is one of the best things about our job, we get to speak about food the whole time – it’s all we pretty much talk about. Talking about a country and a restaurant, a dish, an ingredient, getting inspired. Bouncing ideas off each other, coming up with our next exciting experiment. Somewhere in Italy is always on our wish list .. pasta, may we say more. And its Puglia that’s caught our attention. Puglia, the heal of Italy’s boot is hot and dry with a beautiful coastline, lush farmland, ornate churches, ancient ruins and the home to “trulli” white stone huts with distinctive conical roofs. It’s also home to many of the foods Italy is famous for! Its deeply-rooted cucina povera tradition means its cuisine tends to be simple and delicious, relying on fresh, local produce. The pasta from the region is Orecchiette: Literally meaning “small ears” in Italian, this homemade, ear-shaped pasta is usually served with cime di rapa (broccoli rabe) and garlic, or fresh tomatoes and ricotta cheese. The shape is ideal for soaking up any delicious sauce. The wonderfully creamy burrata also comes from Puglia – a fresh cows milk cheese (occasionally buffalo milk) is made from mozzarella and cream. The outer shell is solid mozzarella, while the inside contains stracciatella and cream, giving it the amazingly soft, stringy texture. When you cut open a burrata, it oozes with buttery and creamy panna containing scraps of mozzarella. The cream has a rich flavour and has to be eaten immediately since it is a fresh cheese. There is no need to overcomplicate a burrata recipe – we often serve it in Spring with blood orange, rocket and olive oil – the citrus cuts through the creaminess. Here we have jazzed up tomatoes with saffron and smoky chorizo (you could use nudja instead if you can find it) or a just smoked paprika if you want to keep it veggie. As the tomatoes slowly roast down they become fragrant, sticky and sweet – absolutely delicious with the fresh burrata and you want some good hunks of sourdough to mop up the juices. 2. Heat the chorizo in a small pan over a medium heat till just starting to caramelize. Remove and place into a oven dish with the fennel seeds, baby tomatoes, shallot, dried chilli and thyme and combine. 3. Whisk together the olive oil, balsamic, garlic, soft brown sugar, saffron and season with salt and pepper. Pour over the tomato mix and place in the oven for about 20 minutes till looking roasted and juicy. Take out the oven and spoon into a dish, scatter with rocket. 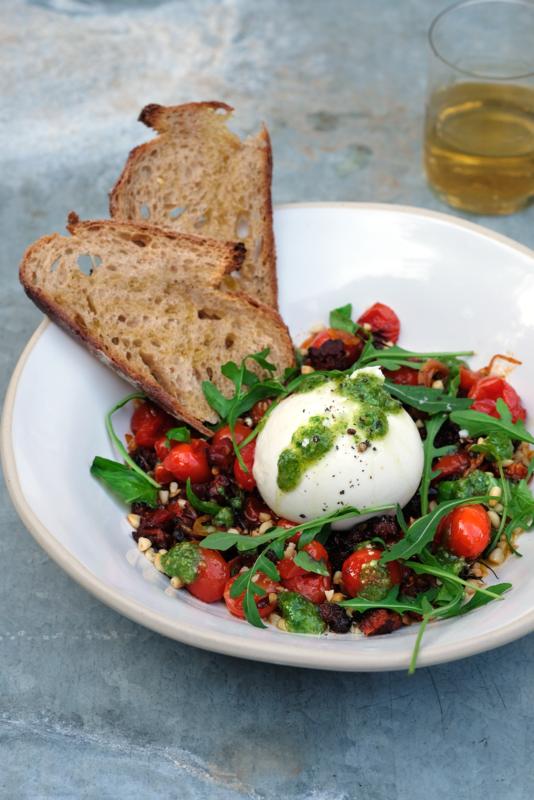 Place the burrata on top, drizzle with olive oil and basil and serve with grilled sourdough.